The history of Rome is that of a city which originally had only a few miles of territory, and gradually extended its dominions at first over Italy and then over the civilized world. The following map of the countries that were once part of Roman Empire c395AD. Every single country surrounding the Mediterranean Sea was ruled by the Romans. The content of this article provides interesting history, facts and information about life in Ancient Rome including Map of the Roman Empire. 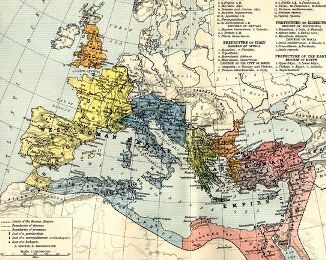 The above map of roman empire after the first century AD illustrates the amazing conquests of the Ancient Roman Empire. When the countries that were once part of Roman Empire c395AD are listed, as shown in the table below, their achievements are even more appreciated. The above Map of the Roman Empire illustrates just how massive the Roman Empire was. The capital of the Rome Empire was in in Rome, which was ruled by an Emperor. Rome was at first only a small fortification; under the kings and the republic, it greatly increased in size; but it could hardly be called magnificent before the time of Augustus Caesar. The first Emperor of Rome was Augustus Caesar, from the year 27 BC. Rome had initially been ruled by ancient kings but then became a Republic ruled by a Council. The content of this Map of the Roman Empire category on life in Ancient Rome provides free educational details, facts and information for reference and research for schools, colleges and homework. Refer to the Colosseum Sitemap for a comprehensive search on interesting different categories containing the history, facts and information about Ancient Rome.